You will earn 3,015 Reward Points. Earn 1 reward point for every 1 dollar spent. Range mount gas infra‑red salamander broiler. Two 20,000 BTU (5.86 kw) atmospheric burners, each with a Hi‑Lo valve. 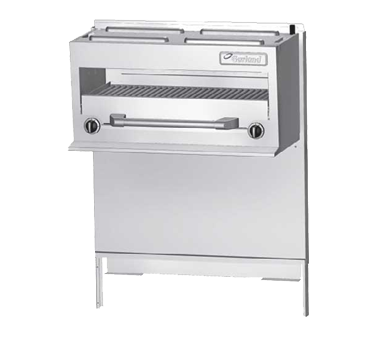 Fixed position, roll‑in, roll out broiling rack with flat or tilt positions. 34" (864mm) wide x 19 3/8" (492mm) deep x 73 11/16" (1872mm) high when mounted on a range. Refer to drawing for detail specifications. 40,000 BTU (11.72 kw) total. Natural or propane gas. Available as counter top or wall mounted models - CFIR36CM.